Phil Hieter, former GSA President and a Co-Chair for The Allied Genetics Conference, works at the University of British Columbia (UBC) in Vancouver, Canada, where Dave Ng directs the Michael Smith Laboratories Teaching Facility, AMBL. 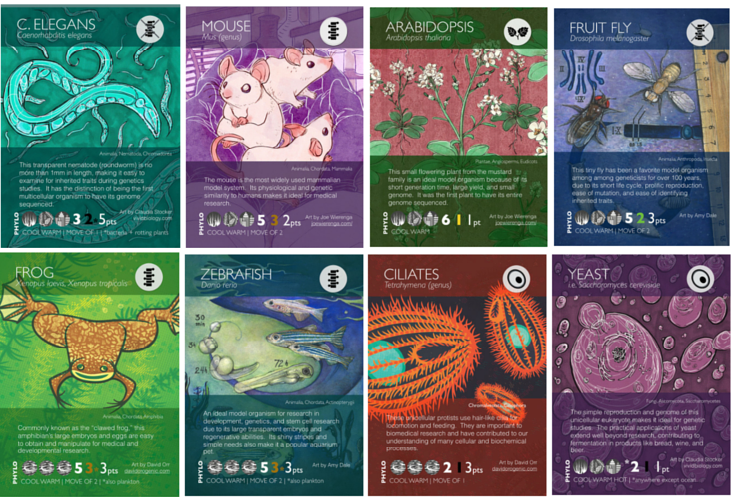 Dave developed a popular card game, Phylo, as a method to teach people about biodiversity, and Phil had an idea—what if there was a card game that highlighted the importance of model organism research? 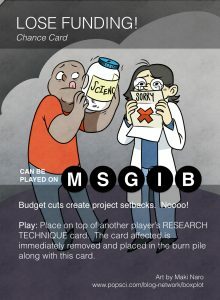 Ultimately, GSA provided funding for several UBC summer interns to create the game mechanics and cards for a GSA Model Organisms Deck. Two undergraduates, Lu Li and Sam MacKinnon, and two graduate students, Sidney Ang and Genevieve Leduc-Robert, worked for several months fine-tuning the game and content, which then went through several rounds of editing and playtesting both within and beyond GSA. Dave hired several artists to make beautiful, unique art for the deck as well. 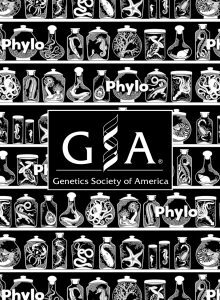 The GSA Model Organisms Deck will make its debut at The Allied Genetics Conference; thanks (again) to Phil’s pursuit of sponsorship partners, each TAGC attendee will receive their own deck free of charge! The GSA deck is designed to be educational; to that end, TAGC is also hosting several “Hackathons” as part of its Education Pre-Conference, not only showing participants how to play, but allowing them to use the deck to create lesson plans, new game mechanisms, and/or new cards for the deck. It’s not too late to register for this if you’re attending the meeting; simply email Anne Marie Mahoney for details. Phylo began as a biodiversity-themed card game, and has been crowdsourced into existence. Because of the fluid nature of workshopping the game over the years, as well as the myriad of different expertise from the participating scientific communities, Phylo has turned into a STEM-based trading card culture with over 1000 free print-your-own cards, as well as around 15 decks that are purchasable for collecting and playing. This includes decks that focus on specific geographical locales, women in science issues, phytochemicals, pond critters, things Darwin saw during his Beagle voyage, and the list goes on—and will continue to go on. The GSA is releasing their deck at TAGC. It’s awesome and all attendees will be getting a copy. Can you tell me about the GSA Model Organisms Deck? The GSA deck is special because it focuses on experimental narratives, particularly around model organisms. The primary rule set for the Phylo game is based on trophic connections (like a game of dominos, but you connect cards based on food chain considerations). Obviously, you can’t emulate this game mechanic with model organisms eating each other! So we needed to create a new gameplay and a new set of rules for this deck. These rules revolve around getting points by finishing your “projects,” which are completed by collecting the appropriate cards (including the organism(s) you’re working on, the methods you need to use, etc). As this unfolds in the game, there are also cards that make project completion easier or harder—these reflect common occurrences in research culture (such as grant approval, sample contamination, switching projects, etc). You can also collaborate on projects by sharing cards. Definitely kudos to the design team, which was composed of genetics grad students and undergrads, as the gameplay is quite well done! One of the current buzzwords in education is “game-based learning”—what are the benefits of using gaming in a learning environment? The academic research that looks at game-based learning is still pretty young, and a bit amorphous to be honest. Most of the research is concerned with digital games, but there’s also growing interest in analog games (such as card games, board games, or tabletop role playing games like the GSA Phylo deck). Generally, the merits of using games lie in enhancing engagement, since concepts of “play” and narrative factor into engagement so strongly. Enhanced engagement can then, in turn, lead to better uptake of prescribed learning objectives. One of the things that we’re most interested in researching is what happens when students “design” the game themselves. In other words, if you provide students with a framework that asks them to “make a game that somehow includes these learning outcomes” – what then? From our preliminary observations, where the framework suggests the production of an analog game with the prototyping done with paper and pen, it looks like this might work as a great exercise in inquiry-based learning. In their effort to create a game that makes the concepts fit, students end up really diving deep into the content. It’s quite a challenge to develop game mechanics that emulate a scientific concept, but it’s also fun to make a game, so the engagement and effort are still there. 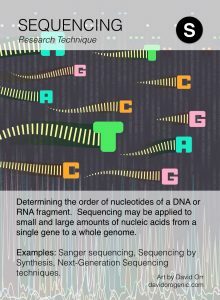 It’s our hope that a game like the GSA Model Organisms Deck in Phylo can give teachers a hybrid experience: the deck can be used as an educational resource, as-is; or it can segue into lessons where students need to design modifications (“mods”) or expansion packs to introduce other genetic-themed concepts. The game has playtested really well, but we’re particularly excited to see what educators can do with it. Phylo is very open to mods, which means that it can be used effectively in an educational space. This is why we’re hosting a few hackathons at the conference. I think with the calibre of folks in the genetics education space, we could come up with some pretty cool mods, and/or lesson plans to go with the game. You are having a “Collaborative Hackathon” at TAGC—what’s a hackathon?? “Hackathon” typically describes an event where a group of experts converges and collaborates intensively. They are explicitly goal-oriented in that there is something tangible to deliver. Added to that, (and this is where it gets fun) hackathons largely thrive on doing all of this in an insanely short period of time, with lots of juggling of various factors, and with full realization that you have to make do with limited or no resources. Culturally, this is more about sweatpants and copious amounts of caffeine, rather than looking important and taking the expert out for dinner. It’s especially common in the technology sectors, notably in the culture of computer programming where the term “hack” originated—but these days hackathons are widely used in a variety of forms, involving a diverse range of different disciplines. If you can hack computer software, games, science, policy and artistry, why not teaching? At the TAGC Education Pre-Conference Hackathons, we’ll spend the first 45 minutes focusing on the game: how it came to be, how it plays, and then actually playing with the GSA Model Organisms Phylo deck for a bit. After that, we’ll spend 15 minutes or so showing attendees what other groups and teachers have done with Phylo decks. Finally, everyone will put their pedagogy hats on and think about how they can incorporate the game into common genetics themed learning objectives. This may take the form of a designed lesson plan that asks students to dig a little deeper; it may take the form of thinking of new cards that focus on a particular scientific area (say, an expansion pack); it may even involve thinking of entirely new games that borrow existing mechanics found in the GSA game. That’s the beauty of this hackathon: anything goes, but there is the expectation that you will have something to show off. The other beauty, of course, is that it’s perfectly acceptable to fail at your final goal: indeed, in hackathon culture, the element of failure is a key component of this process, because it sets the stage for reiteration. How can people get their hands on their own GSA Model Organism Phylo deck? Thanks to Phil Hieter securing sponsorship from the Canadian Institute for Advanced Research, the Canadian Institutes of Health Research, the Canadian Society for Molecular Biosciences, the Michael Smith Laboratories at UBC, and the Rare Diseases: Models and Mechanisms Network, each attendee at The Allied Genetics Conference will receive a “Phylo GSA Starter Deck”—this is the full GSA Model Organism Phylo Deck as well as some blank cards allowing the addition of new organisms, projects, and methods. For those not attending TAGC, the GSA Model Organisms Deck will also be available online at the Phylo website; people can download the cards and print them for free to make their own decks, or professionally printed decks will be available for (revenue-neutral) purchase. Hackathon attendees will also get an account on the Phylo website, which will allow them to create DIY cards directly on the site! Thanks to Dave Ng for spearheading this project and for taking the time to answer our questions. Also, thanks to the students who developed the original concept (Signey Ang, Genevieve Leduc-Robert, Lu Li, and Sam MacKinnon), and all those who have playtested the game. Want to play with the GSA deck and collaborate on new cards, lesson plans, or game mechanics? Email Anne Marie Mahoney and ask to register for the Educator Flexpass, which will give you access to the TAGC Education Pre-Conference. The “Collaborative Hackathon” sessions will be held on Wednesday, July 13, 2016, from 9 am – 12 pm and again from 1 pm – 4 pm. We will post a link to the final online version of the GSA Model Organisms Phylo deck here as soon as it is live! UPDATE: Here is the final deck! You can either download the printable version or buy a high-quality pack at a revenue-neutral price.